"Mere existence had always been too little for him; he had always wanted more"
A little more than nine months ago, I reviewed the book Little Women on my blog. My chief issue with the book which I loved otherwise, was that it was morally preachy. I was not comfortable with the general idea that the book imparts; that good things happen to good people and bad things happen to bad people. At that point of time -- and I am narcissistically about to quote myself here, thereby entering the annals of quoting people as the first ever (and only?) person to quote me -- I felt that "life is more like a movie directed by Coen Brothers, filled with absolutely random justice". How much reversal of opinion is a person allowed to make within nine months? I always take the liberty of reversing opinions to the largest extent possible. So here I am, gushing over Dostoevsky's Crime and Punishment for the very same reason that had made me feel skeptical about Little Women. A little digging around the things that influenced my mood when I started Dostoevsky's epic, for I am a moody person, tells me that I had watched a few episodes of Breaking Bad. The idea of Walter White slowly turning immoral, while simultaneously becoming more "cool" made me feel a little uncomfortable. Crime and Punishment brushed off all such discomfort, and I am giving it two thumbs up. It is ironic that I wanted to read Crime and Punishment only because I had felt that Match Point, Woody Allen's reinterpretation of the Russian novel, to be brilliant. Match Point's central theme is the role that randomness plays in life. But halfway through Crime and Punishment, I was pretty sure that I did not want the fate of Rodion Raskolnikov, a cold blooded killer, to be decided by luck. His crime needed a punishment. Rodion Rashkolnikov is the ideal protagonist, for he is a loner; someone who feels the company of outside people too dull for his intelligence. He is the sort of protagonist that most readers will instantly root for. After all, almost every single one of us has moments when we think that the society is not good enough for us, when we get exasperated at the lack of intelligence of the collective, and consider ourselves as iconoclasts. Most of us are in denial about the fact that we, almost without exception, are the "average" in an average society (Dostovskey might not agree with me though. In a different context, he says "A normal man, it is true, hardly exists. Among dozens – perhaps hundreds of thousands – hardly one is to be met with"). Rodion is an impecunious student from pre-revolution, pre-communist Russia; an ex-student, for he has discontinued his studies. A man of strong character, the kind who forms his own ideas rather than adopting someone else's, he is in constant need of tiny amounts of money to lead his ascetic life. Alyona Ivanovna is an old pawnbroker, some one who is "a stupid, senseless, worthless, spiteful, ailing, horrid old woman, not simply useless but doing actual mischief, who has not an idea what she is living for herself, and who will die in a day or two in any case". In his idleness, as a thought experiment, Rodion forms a plot to murder this old woman, and reasons that his action would result in more good for the World than evil. Working through moral dilemmas, mental anguish, and a bit of fortune ("when reason fails, the devil helps! "), he goes on to commit the crime. Crime and Punishment deals with the aftermath of the crime : the mental anguish that Rodion deals with due to his actions. Crime and Punishment is a classic in most senses of the word. One sense in which it is not a classic is that it is not very tedious to read. At times, it might even qualify to be called as gripping. Dostoevsky obviously knew his craft well. The writing is simply brilliant. He packs the novel with outstanding observations of the human mind. If I could write a single sentence with as much wisdom as Dostoevsky doles out sentence after sentence, I would consider myself a genius. Take "Man grows used to everything, the scoundrel! ", or "A certain percentage, they tell us, must every year go.. that way.. to the devil, I suppose, so that the rest may remain chaste, and not be interfered with", or "There are instances of it with everyone; human beings in general, indeed, greatly love to be insulted, have you noticed that? But it’s particularly so with women" and so on and on and on. His characterization is stunning too. There are only a few characters, and everyone has a part to play. What mind-bogging power of observation must Dostoevsky have had! He lays bare the deepest motive of every single character in a way that is unsettling, for I kept comparing myself to various characters. We have Pulcheria Alexandrova, Rodion's mother, who is "emotional, but not sentimental, timid and yielding, but only to a certain point. She could give way and accept a great deal even of what was contrary to her convictions, but there was a certain barrier fixed by honesty, principle and the deepest convictions which nothing would induce her to cross". His sister Avdotya, who is a woman of dignity. A strong minded woman who is fiercely independent. "Why do you demand of me a heroism that perhaps you do not have either? ", she asks Rodion. We have Sofia, who is a bundle of unpolluted goodness, someone who hopes even in the most hopeless of situations. "To my thinking, you, with all your virtues, are not worth the little finger of that unfortunate girl at whom you throw stones", says Rodion in her defense, and rightly so. Porfiry, as the detective in-charge of finding the murderer brings in a bit of investigative angle, and a lot of psychological mind games. "The general case, the case for which all legal forms and rules are intended, for which they are calculated and laid down in books, does not exist at all", says Porfiry. There is the mystical Marmeladov, who knows everything that is wrong with him, but is still unable to remedy it. He is proof that Socrates was wrong: knowing the right thing to does not automatically lead us to doing it. And we have Svidrigailov, the most complex of all characters ("Everyone thinks of himself, and he lives most gaily who knows best how to deceive himself. Ha-ha! But why are you so keen about virtue? Have mercy on me, my good friend. I am sinful man”). My most favorite character is Razumihin. He is the loyal friend, seeing only the good in the World. Razumihin never loses trust in the basic virtues of kindness and friendliness. He is a man of "vulgar politeness". He is also extremely rational, but has enough sense to realize that one does not always allow reason to dictate terms. To me, Razumihin is the hero, the character who shows us how not to allow pure logic to dictate terms. "You can’t skip over nature by logic. Logic presupposes three possibilities, but there are millions! ", he argues. To him, nothing is more important than a single individual. He does not commit the folly that Rashkolnikov does, of thinking of humanity as more important that an individual. How often do you see characters that need to be given importance being shunned aside, so that the protagonist is built up? Most writers would gladly reduce Razumuhin to a wise-cracking sidekick. Such mistakes are for lesser writers. 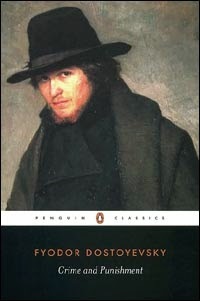 Dostoevsky is firm control though, and he does not let us down. The central theme of Crime and Punishment is that of "superman" -- that theory which connects Friedrich Nietzsche, Adolf Hitler, and Alfred Hitchcock's Rope. Rodion believes the laws are defined for ordinary people, and do not hold true for "great" people under certain circumstances. With a touch of genius, Dostoevsky deals with a myriad other themes too. Alienation from society is one. The nature of crime is a very important recurring theme. "Crime is a protest against the abnormality of the social organisation, and nothing more; no other causes admitted…. From which it follows that, if a society is normally organized, all crime will cease at once" is opposed with a "A man of forty violates a child of ten; was it environment (that) drove him to it?". Which brings us to the key aspect of Dostoevsky's writing : Despite his immense wisdom, not once does he come across as patronizing. He does not even stop to judge his own characters. All his observations are passed with a detachment, a sort of this-is-how-things-are-and-they-can't-be-helped tone. He writes with a resignation that almost gives up on humanity getting any better, and I love him for it. The most we can do with human nature is understand it, there is not much we can do to remedy it. If I have to look hard for a flip side, one needs a grasp of all the themes in the story to enjoy it better. I have always believed that there is a right time for reading classics. Too early, and you risk alienation from a wonderful book. But there is no question of whether the book is to be read. Crime and Punishment is one of the best books I have ever read. I am stopping just short of calling it a must-read, for I have a feeling that Dostoevsky might not have approved of laying down what one must do and what one must not do. "Like most misery, it started with apparent happiness"
Of course, I’m being rude. I’m spoiling the ending, not only of the entire book, but of this particular piece of it. I have give you two events in advance, because I don’t have much interest in building mystery. Mystery bores me. It chores me. I know what happens and so do you. It’s the machinations that wheel us there that aggravate, perplex, interest, and astound me. 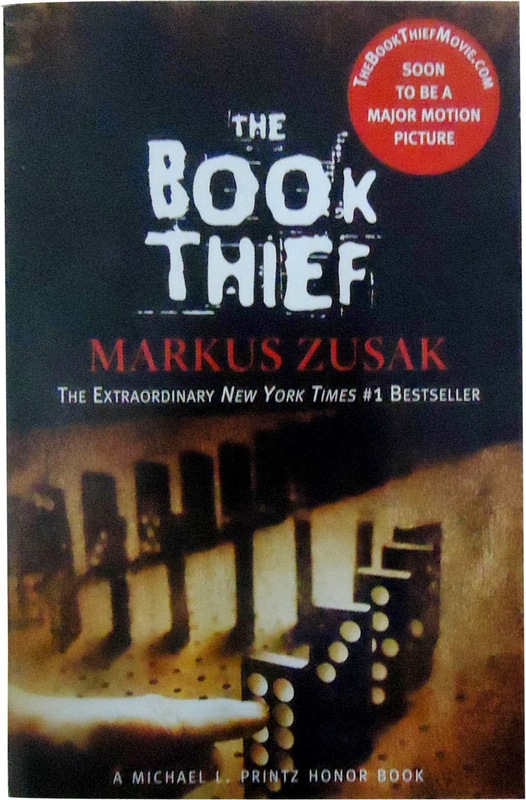 The Book Thief by Markus Zusak is a fairly modern novel, but it is yet another story set during World War 2 Germany. The Book Thief reminds me -- due to my own ability/snag of relating completely unrelated things -- a lot of Odd Thomas by Dean Koontz; another profound book. Both The Book Thief and Odd Thomas are stories set in the backdrop of immense tragedies, and told with an unexpected sense of humour. The narrators in both the stories seem to be attempting to gloss over the tragic parts by narrating the events with a detachment. The tragedy is so pronounced in both the stories that it still manages to creep in, with far more impact than it would have otherwise. Odd Thomas is mostly about the struggles of one person in dealing with his tragedies, whereas The Book Thief is about the tragedy of a country, or even humanity as a whole. Markus Zusak wastes no time in capturing the reader's attention. He does this by using the unlikeliest of narrators -- death. The very idea keeps you engaged throughout. It is interesting to think of death to be as fascinated about humans as we are about death. The narrative style is extremely bold and unorthodox. There are fore-warnings and there are sometimes-diverting asides that highlight key points (as if you are reading a technical manual). To tell a story, and to tell it well, with such an unconventional style requires an excellent command over vocabulary, and Markus Zusak pulls it off brilliantly. The Book Thief is Liesel, a young girl beset on all sides by tragedy. She is a survivor, "an expert at being left behind". Circumstances take her to a town called Molching (apparently, it translates from German to heaven), where she lives with foster parents. The Book Thief is the testament to the power of books, the power of words, to take us through immense tragedies. The Book Thief is also about the good that remains in people, and manifests itself in the most unlikeliest of circumstances. It is about humanity, which is made up of "so much good, so much evil". It is about a girl who learns to read, to write, and to get through great loss. ..barely visible. An-un-special person. Certainly, his painting skills were excellent. His musical ability was better than average. Somehow, though, and I’m sure you've met people like this, he was able to appear as merely part of the background, even if he was standing in front of a line. He was always just there. Not noticeable. Not important or particularly valuable. Hans Hubberman manages to win hearts though, and he does it through "the brute strength of the man’s gentleness, his thereness". There is his wife Rosa who possesses "the unique ability to aggravate almost anyone she ever met" , but is still a "good woman for a crisis". There is the endearing Rudy Steiner, Liesel's partner-in-arms and best friend, who does not hesitate to exercise his "God-given right to stupidity". There is Max -- someone who is forced to live a life filled with guilt and shame for no fault of his own. And there is Ilsa Herman, who "had decided to make suffering her triumph. When it refused to let go of her, she succumbed to it. She embraced it". Add to this a few "cameo appearances" from other minor characters, and you have the town of Molching. Each of these characters is extremely well etched out, though Zusak seems to shower special attention on Hans and Rudy. Apart from Liesel, that is. Oh, how the clouds stumbled in and assembled stupidly in the sky. Great obese clouds. Dark and plump. Bumping into each other. Apologizing. Moving on and finding room. And Zusak does not moralize. It helps a lot that the narrator is impersonal -- can anything be more impersonal than death? There are general observations that creep in though, remarks made in the passing, such as "I guess humans like to watch little destructions. Sand castles, houses of cards, that’s where they begin. Their great skill is their capacity to escalate. ", and more trivially, "No one’s urine smells as good as your own". These are completely non-judgmental though, and the tone is strictly that of wonder and incomprehension at the extremes of human behavior. The flip sides I had with the book are probably out of my own doing. I had to squeeze in time to read the book, and barely managed to hurry through a few pages each day. It took me a month to finish it (despite the fact it is seldom dull) . But I did feel that the book didn't really live up to the expectations I had of it. I didn't get the broader point of the whole novel. And when a writer reveals the end prematurely, "the machinations that wheel us there" must carry the whole burden of the plot. The Book Thief falters a little in that regard, like another highly acclaimed work -- The White Tiger by Arvind Adiga. Despite all these probable faults, which might not be faults at all if I had read the book as I ought to have, the writing keeps you very engaged, and there are characters worth loving and recalling (Rosa and Hans are my favorites). I would recommend this read without any hesitation. And regarding Markus Zusak, I am looking forward to read more by him, and would be starting as soon as I can with his other books. We have a potentially great modern author, and we better keep a close eye on him. Apart from being one of my shortest posts, it is also one of my quickest. For nearly 4 years, I have been trying to convey a similar idea through a blog post, and my draft folder holds the evidence of multiple false starts. Glad that I was able to convey atleast part of that idea, without my usual seriousness.